Ski in/out from the top! So let’s compare good things about a perfect skiing trip. The weather is important! The lift queues and number of people on the slopes. The area in itself – matching your skills and preference for challenge. The accommodation, the food, the after-skiing – numerous things makes up a good skiing trip. But one thing beats it all – powder and untouched slopes! And how do you get that? How do you get to the slopes 20 minutes before the rest of the crowd lining up at the lift station at opening hours?! 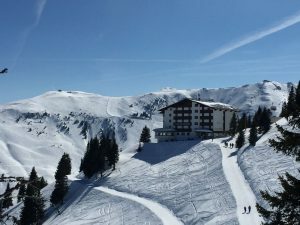 Hotel Ehrenbachhöhe is nothing less than a perfect placed hotel in terms of slope access. We were lucky enough to have several days with fresh powder on completely untouched slopes – and they were literally untouched, not even snow scooters or piste crew had ruined our morning runs. The hotel itself offers a cosy, typical Austrian family-like atmosphere in a clean and comfortable, but rather old-fashioned style. 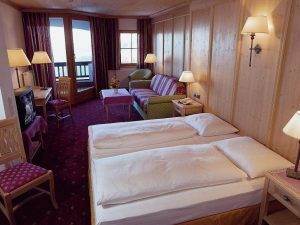 The rooms are very spacious – the cheapest double-bed rooms are larger than the average Austrian ski-hotel rooms and if you upgrade to junior suites or panorama suites you will be stunned when you open the door for the first time and realizes just how much space there is! Obviously there is a cost to upgrade, but compared to what you get in return, it seems very fair. In the afternoons, all guest have access to a very nice, free of charge, snack buffet, or “jause” as they call it locally. The buffet itself is very delicious and varied, however any drinks like coffee, the, water or juice will be charged to your room which is less favourable than in many other hotels of similar standard. Once you have picked your favourite jause plate, you can go to the sun-terrace exclusively for hotel guests. It’s the perfect spot for an afternoon tan and you will have great panoramic views as well as to one of the chair-lifts running closely by. It is quite fun to sit there with your coffee while waving at friends or family passing by 30 meters away. Due to the location at the top of the mountain, and lift services ending at 17.00, you obviously need the half board which is standard on all room bookings. 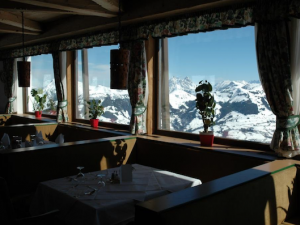 Dinner is served in a panorama-like restaurant, and once again you will be reminded, that you are actually at the top of the mountain and everyone else have departed the slopes, staying 1 km below you in the city of Kitzbuhel. The four or five course dinner is a nice and delicious experience, without being “gourmet”. While we were there, the waitresses seemed somewhat confused and unable to cope with the number of people in the restaurant (even though not full), but they are friendly and it matches the atmosphere of the Ehrenbachhöhe which is more “we-are-one-big-family”-like than the traditional, more distanced hotel-like experience. This is also true in relation to the pool area and ski-storage room. The latter is quite old fashioned and worn out, e.g. no boot dryers, and the pool is very simple and, while we were there, not as clean and tempting as you would expect from a quality hotel. But then again – you are not really here for the pool or a “Spa-experience”. At the Hotel Ehrenbachhöhe, location is everything. The facilities and the hotel itself is a good 3-star experience, but the location is 5-star plus! Those first morning runs, all by yourself, in a fantastic ski-area, is second to none. I would recommend it without hesitation and will for sure be coming back! Might be a stupid question but how do you get to the hotel with your luggage…?? Hi Otto – lift crew will load your luggage to the gondola in the city and arrange the pick up at the top and transport it to the hotel. So you just put your skis on, enjoy the slopes and when you decide to go back to the hotel, your luggage will be there 🙂 Very smooth. Price for 4 people was around 50 euros totally (arrival/return) to be paid at the lift station in the valley.